Watch Out for the Bad Guys! | Kid Reporters' Notebook | Scholastic Inc.
Watch Out for the Bad Guys! Aaron Blabey, who recently visited the United States, displays books from his bestselling Bad Guys series. “The most important thing when you’re making a book for kids is to make sure that it’s not boring,” says author and illustrator Aaron Blabey. Blabey, who lives in Australia, was an award-winning actor before he turned to writing children’s books. He recently traveled to the United States to talk about the Bad Guys, his best-selling graphic novel series published by Scholastic. The series chronicles the adventures of a group of scary-looking animals who become friends. Together, they try to undo their bad reputations by performing good deeds. DreamWorks Animation is now making a film adaptation of the series, with Blabey serving as executive producer. How did you come up with the idea for the Bad Guys? I have two boys who are 9 and 12 years old. When my 9-year-old was a bit younger, he was bringing home early reader books. Some of them were so boring that he just hated [reading]. I wanted to write something that he would think was fun. At the time, he was very into scary animals. I was thinking about writing a book about [people who are treated badly] because of the way they look. I put the two things together, and that’s where the Bad Guys came from. Once I had the idea, Mr. Wolf, Mr. Snake, Mr. Piranha, and Mr. Shark just came tumbling out. What are the most rewarding and challenging parts of your career? 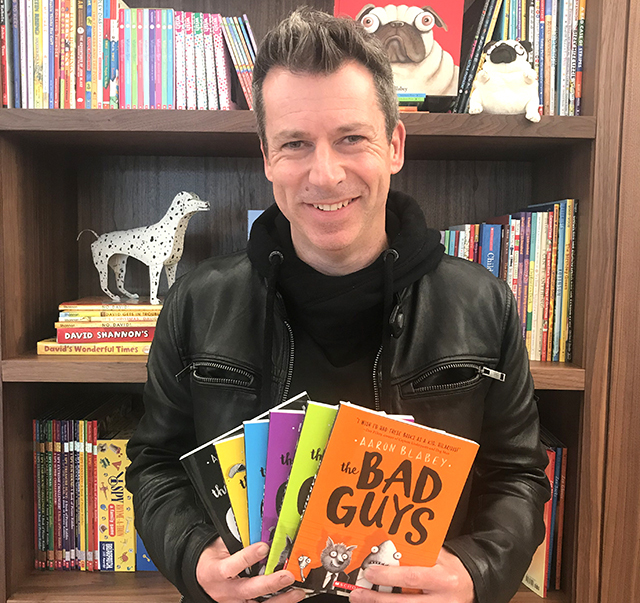 Probably the most rewarding part is that I get emails all the time from parents and teachers saying that they have kids who used to not like reading and now are reading the Bad Guys. Not only that, but they can’t wait for the next one. The most challenging part? I don’t know. I guess it’s that I’m super busy. I’ve been doing five books a year. I’ve been doing two Bad Guys books and two picture books, so I can just never stop. There is nothing about my job that I don’t love. What were you like as a kid? Were you a good student? I was always moving from town to town, and I didn’t have brothers or sisters, so I was pretty shy. I didn’t know many people. It wasn’t until high school that I started to figure out who I was and what I was interested in. In high school, I was a pretty good student. I do remember that in year seven, which is the first year of high school in Australia, I had an English teacher who encouraged me to write. It was the first time that I had ever tried to write something creative, and I remember really liking it. What did you like to read growing up? My favorite was the Adventures of Tintin, a comic-book series created by Belgian cartoonist Georges Remi. When I moved to a new school, I’d go straight to the library and find the Tintin books and read them. I had the whole series memorized by the time I left school. I’m like a crazy, obsessive nerd who collects music. I’ve got thousands and thousands of records and a lot of good movies, too. My boys go basketball crazy, so we go and play basketball. We watch a lot of movies and play a lot of basketball on weekends. What is your best advice for aspiring authors and illustrators? Just to not give up because the whole world is going to tell you that it’s going to be really hard, maybe too hard, not many people can do it, blah, blah, blah. But if you love something, and you work super, super hard, and you just never give up no matter what happens, you’ll get there.